Get ready to sing and dance, laugh and love all over again. We screened this film in August when it hit the top of the charts for both film and music. In case you missed it or would like to enjoy the experience all over again, you are invited to return to the magical Greek island of Kalokairi in an all-new original musical based on the songs of ABBA. 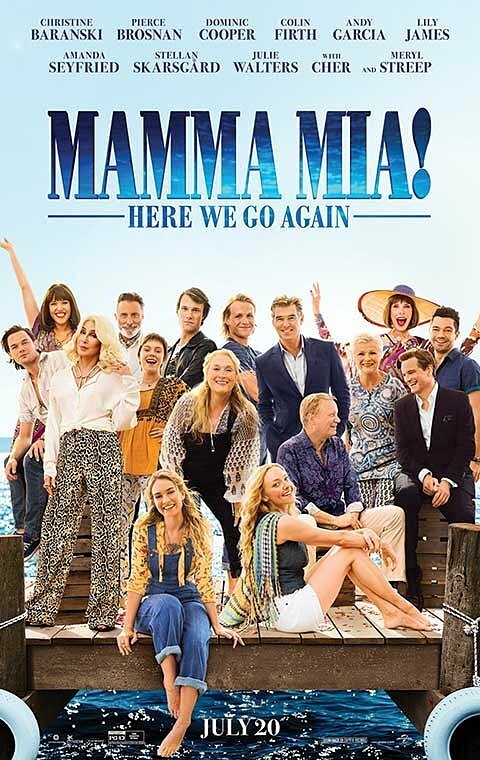 The new film goes through Donna's (played by Meryl Streep and Lily James) young life, experiencing the fun she had with the three possible Dad's of Sophie (played by Amanda Seyfriend). Sophie is now pregnant. Like Donna, she will be young when she has her baby. This is where she realizes she will need to take risks like her mother did as she learns about her mother’s past. Tickets are on sale at the Steyning Centre at £6.00 per ticket which includes tea or coffee during the interval. Wine is available at £2.50 per glass.